Stuff Points: Earn 65 points when you buy this stuff. Tired of finding your bike on the ground? Want to free up space and reduce clutter? Then get this single bike storage rack. It mounts to any wall, and supports your bike by the frame to hold it horizontally, and out of the way. Your bike will be elevated off the ground, and secured in place, so accidental damage will be prevented. Thanks to additional hooks that are included, you'll even have a spot for your helmet, shoes and any other gear. The coated hooks add security while preventing scratches and other marks, and the all steel construction provides plenty of strength to support any bike. It's designed to showcase your expensive road or mountain bike, but because it's fully adjustable, it will even work with small ones meant for children, cruisers and any other type. Kick stands are not reliable, and floor space is limited, so get this storage solution to provide the perfect parking spot for your bike and cycling gear. It comes with all hardware required for installation, and has a lifetime warranty from the manufacturer. Clean up your garage, reduce clutter in your shed, or use in an apartment or dorm to create storage space where none exists. Need to hang more than one? 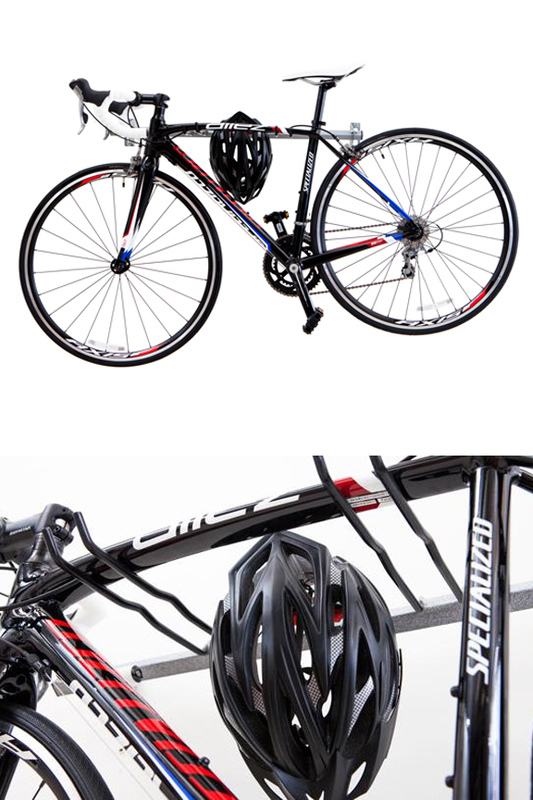 If you need storage space for several bikes, then check out the 4 bike version we also carry. Each one will hang vertically instead of horizontally, but you can keep several in one compact space. Uses Hang and store any kind of bike when not in use. Keep it off the ground to reduce clutter and prevent damage. Compatibility Hang one bike and related equipment. Give your bike a home, and display it in all it's glory. This wall mounted rack on any wall by the frame to hang it horizontally on any wall. Fully adjustable to work with any bike, and complete with extra hooks to hang related gear. Order Yours Today!